The salmonella outbreak in the country has now claimed two lives and has left several ailing in 20 states. The states that have reported the same strain of salmonella (Salmonella typhimurium) include Alabama, Arkansas, Georgia, Indiana, Illinois, California, Iowa, Kentucky, Michigan, Minnesota, Tennessee, Missouri, New Jersey, North Carolina, Ohio, South Carolina, Wisconsin, and Pennsylvania that is suspected to originate from Indiana cantaloupes. Kentucky seems to be the hardest hit with over 50 cases of reported illness linked to the salmonella outbreak. Illinois and Indiana are the second and third most hit states with 17 and 13 reported cases respectively. The Food and Drug Administration (FDA) department has already issued an advisory against the Indiana cantaloupes that are thought to be the cause of the salmonella infection. However, no food recall has been issued as yet. The Center for Disease Control and Prevention has confirmed that about 141 people have been reported ill over these states. The CDC has advised consumers to throw away any cantaloupes from the south west Indiana area. Tests have been carried out by the FDA, which visited the suspected Indiana grower and have promised to release the name of the farm when the results have been finalized. The farm is reported to have stopped production of the cantaloupes for this season and withdrawn the cantaloupe produce already out in the market. It is now up to the retailers and wholesalers to ensure that they don’t sell or serve these salmonella infected cantaloupes to the public. Last year, a similar salmonella outbreak that had contaminated cantaloupes caused the death of 30 people and 146 illnesses in a multi-state outbreak. 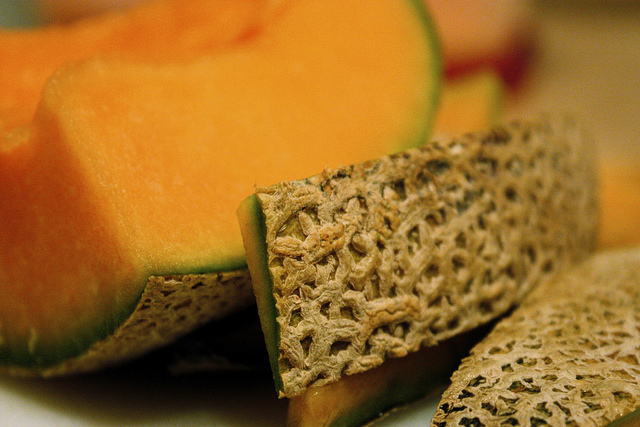 The cantaloupes then had been from Jensen Farms in Colorado.